Dr. Henderson describes his technique for deep brain stimulation surgery at the Sunnyvale DBS Support Group. “Its complicated,” explained Dr.Jaimie Henderson, M.D., Director of Stereotactic and Functional Neurosurgery at Stanford Hospital and Clinics, describing what he calls, “brakes (or breaks) of the brain.” Dr. Henderson spoke at the Sunnyvale DBS Support Group’s meeting at the Parkinson’s Institute in January 2014. Dr. Henderson received his MD from Chicago’s Rush Medical College in 1988, completed his residency in Neurosurgery at St. Louis University in 1995 and completed fellowship training in Stereotactic and Functional Neurosurgery before joining the faculty at St. Louis University, where he started the university’s Movement Disorders Surgery Program,. In 2001 he joined the Neurosurgery staff at the Cleveland Clinic,where he spent 3 years developing innovative surgical techniques for deep brain stimulator placement. 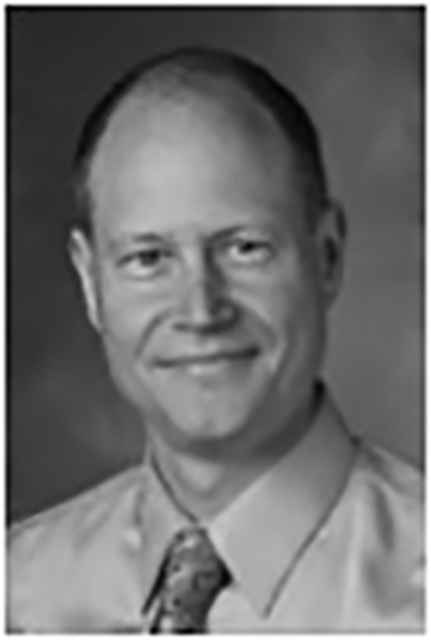 In 2004 he joined Stanford’s Movement Disorders Neurosurgery team. He described how people with PD have a disconnect between inhibit and excitation in their brains. Due to the loss of dopamine, PD people end up with a braking action on the cortex which gives so many of us that jerking “braking” movement known as tremor. Some estimates say that well over a million Americans have Parkinson’s Disease, and another 50,000 get diagnosed each year. For many of these patients, medications either don’t work, or don’t work as well. When that happens, the neurosurgery Deep Brain Stimulation (DBS) becomes an option. Dr. Henderson named his special technique for his surgeries “Frameless DBS.” Instead of the big imposing ring that other DBS patients have to wear during surgery, Dr. Henderson has developed a system including 5 small skull screws (fiducial placement) that Dr. Henderson thinks make it more comfortable for the patient. “The final placement is done with our ears,” he said, talking about the neural sounds of movement that sound like “bacon frying.” He played a sample of the intriguing noise on a video for the audience. He showed lots of informative slides illustrating the neurological disease and talked a bit about his hopes for the future with tensor imaging (Tractography,) a 3D modeling technique used to visually represent neural tracks using data collected by diffusion tensor imaging. The process targets white matter pathways. He also touched on another hopeful procedure–MRI guided focused ultrasound that looks promising. He said that although gene therapy looked like it had promising good results, the company producing it went bankrupt searching tor funding to continue research. According to Dr. Henderson, one hundred million dollars is needed to launch a new medication. Stem cell research is still in the early stages. His speech was followed by an extremely informative session of questions from the audience that addressed many aspects of living with DBS including rehab, dual disease situations, and more. People with Parkinson’s Disease in the Bay Area are fortunate to have incredible neurosurgeons as Dr. Henderson, who give us not only an understanding of DBS, but an up-to the-moment look at what the future has in store. Thank you to the Sunnyvale DBS Support Group and the Parkinson’s Institute for a first-rate PD event.